If you read this blog regularly, then you know that I’ve struggled over the last couple of years with living on my own. The loneliness tends to creep in around dinner time and sticks around until I fall asleep or numb it out with one of my three go-to additions (TV, food, booze). I’ve tried to remedy this unpleasant feeling in other, more productive ways – meditation, working and playing hard (basically keeping busy), and working with two wonderful Huichol shamans (more on that soon) – but I remain susceptible to its pangs more often than I care to admit. Nevertheless, I think it’s a basic human necessity to share your life with someone with whom you share a special intimate bond. However, a recent sojourn into that tricky realm brought to my attention that, more often than not, there is a barrier between me and the rest of you that makes having a healthy relationship difficult, if not impossible. It’s nothing unique. I’m pretty sure there are others who have constructed, knowingly or not, a wall between them and the rest of us too. I picture mine as constructed of red brick, old clay bricks, crumbling to create a substantial pile of red rubble on the ground near its base. Large chunks of mortar are missing and the corners of the walls are uneven and lower than the rest of the wall. It’s old and failing, but it still separates me from you. Sometimes I can’t even see or hear you on the other side. Your wall might be made of stone, concrete, straw bails, or maybe it’s just a sheet of plastic that you can pull down in one fell swoop, but it’s there, separating us, keeping us from connecting. You say I’m just writing in metaphor, but I say it may as well be real because there is nothing more powerful in keeping you from what you want than FEAR. Fear keeps me bottled up too often. I don’t write more because I’m paralyzed by fear. I don’t reach out to more people because I’m afraid. And fear keeps me from expressing who I really am, in so many ways, far too often. The blessing is that whereas I’ve been oblivious to its influence on my behavior for most of my life, I see the fear now, recognize it and my attempts at subverting it. I see now how I’ve hurt myself, lost sleep, and a lot of hair trying to outrun the fear. A lot of my actions – like surfing hard, stressing over my body image, and needing to know all the answers – are just me trying to cover up my intense fear that you’ll discover I’m imperfect and therefore unacceptable and unlovable. I’m so afraid of rejection that I do back flips in an attempt to prove to you that I deserve your love and attention. The funny thing is that I had to be rejected to see how much my actions are motivated by my keen desire to avoid that very rejection. I fell for someone recently, and as is typical for me, I fell hard, fully, unabashedly, and, it turns out, foolhardily. At first he seemed to be falling too – we were two people falling into the fuzzy abyss of love with big smiles on our faces, holding hands on the way down. We seemed to read each others minds and synchronicities abounded when we were together. For the first couple of weeks I couldn’t walk down the beach without finding heart-shaped rocks. Not just “a” heart-shaped rock, but rock after rock. One of them, about an inch across and pink, was almost perfect. My interpretation? Our love was divinely orchestrated. But then he let go of my hand and I kept falling. I fell for a while before I realized that I was on my own in feeling the way I wanted so badly to feel and to be felt about. I was pretty deep down in that hole when I finally accepted I was alone down there with a goofy grin on my face, holding on to nothing. That was hard. It felt a lot like someone kicked me in the stomach with steel-toed boots. I guess it was the impact of hitting the hard reality waiting for me at the bottom of my free-fall into unrequited love that knocked the wind out of me. What really happened was over the course of several weeks the other person’s actions (like his reaction when I gave him that pink heart-shaped rock) and what those actions said about how he felt sank in, and I had to admit to myself, “He’s just not that into you.” Yeah, no one wants to hear that, even if it’s your very own heart gently sitting you down and telling you like it is for your own good. I cried a lot that evening. I took a walk down the beach as the sun was setting and felt the hurt and the anger bubbling up to the surface despite my attempts to keep them down. It all came out in a big blubbering, tear- and regret-filled emotional waterfall. I was angry with myself for being such a fool, for jumping into the deep end of a relationship once again, for wanting it to be what I’ve waited for so badly that I rushed in without giving things time to cure, without giving either of us time to discern whether this was the path forward or not. As the anger dissipated, it was replaced by sadness as I felt, once again, the hole in my heart where loneliness lives. “I’m working on it,” I said, looking up at a sky filled with so much beauty I knew my thoughts were heard elsewhere. This experience taught me something that I’ve been unaware of until now. It turns out I’m scared a lot. I’m running scared shitless of what other people think, afraid of people’s judgment, and especially their rejection. My whole life story is driven by avoiding rejection. I’ve said it before, and someone wiser probably said it long before, fear is a poor motivator. It’s a lot like running from your own shadow. You can never outrun it. And I’ve tired of running. The good news is that somehow during this experience, I realized that this heart of mine is full of love. As I ran over in my mind what happened and how things had fizzled so fast, I considered my actions in both romantic and other relationships and saw that they are more often than not caring, giving, and kind – all demonstrations of love. Gratitude, appreciation, and empathy are all rooted in love as well and these are emotions I experience daily. This made me realize that the fear that has driven me so often is not so much solid like a wall, but merely a smokescreen hiding the love that has always been right here inside me. 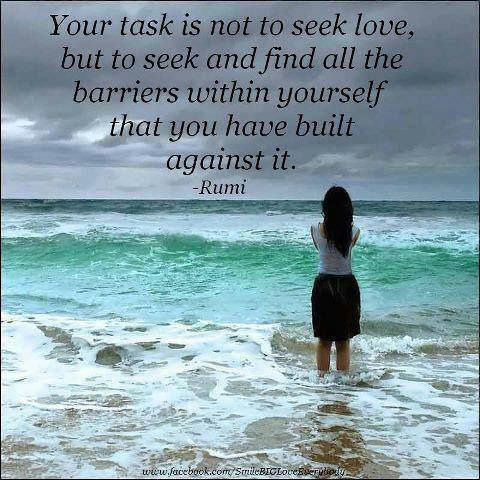 To transform it and pass to the other side where we can all connect, I just need to turn that love inwards and recognize that I deserve my own loving embrace as much as anyone else does. So far, I mostly know this intellectually, but little by little I’m beginning to feel it in my soul. 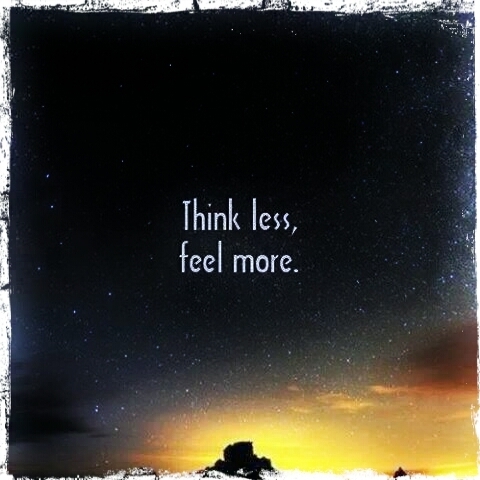 “Think less, feel more” was one of the many wise things my lover-turned-friend-and-teacher said to me during our courtship. I can feel it right here in my heart, that unconditional love that I keep looking for elsewhere…I’m getting close, so very close. 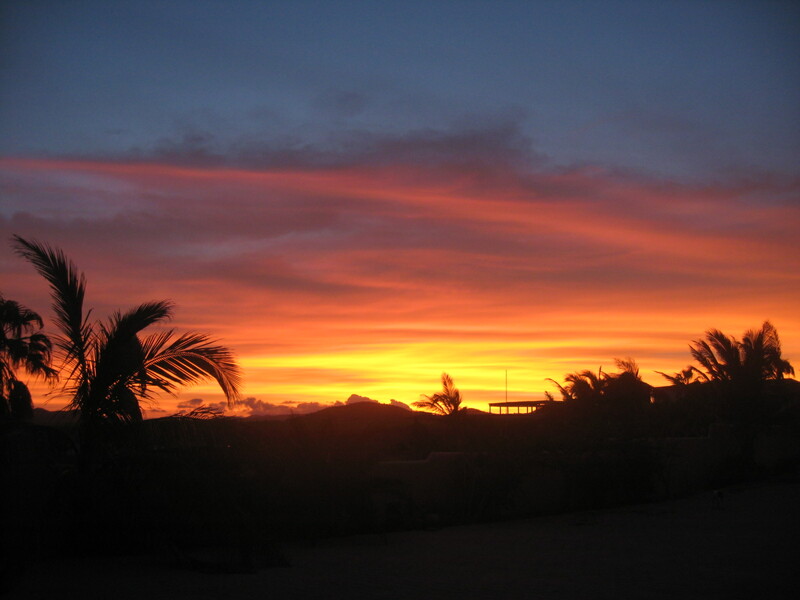 One of the miraculous sunsets we’ve been treated to lately.